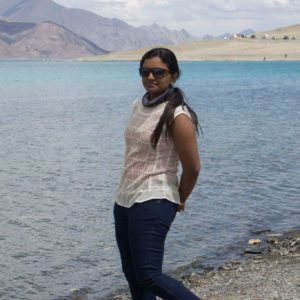 Sritha is currently an employee of ABB Ability Innovation Centre. She handles robotics and applications for her company. Though I had doubts about my teaching skill, after becoming an Ignite volunteer with Bhumi I surprised myself by handling the role pretty good. From being a self-doer to a lead who works along with a team, I have grown much in Bhumi. Throughout my journey I have had solid support from all fellow volunteers. Being with children has made me realize what happiness truly is. Just a ‘Thank you’ or ‘Please don’t leave, continue the class for some more time’, brings tears of joy. Such moments stay forever in our lives. Bhumi is a wonderful place for anyone interested in volunteering as everyone’s ideas are encouraged and supported. Though there is a hierarchy, there is no one above or below anyone. If I were to summarise my experience with Bhumi in just one line, it would be that it is enchanting. My profession is very different from what I do in Bhumi. It gives me a different perspective about life. And I am truly paid in whopping six figures that only multiplies and never leaves your pocket – Smiles! To put things more in context, at Nakshatra sports, a team with only primary school boys was keen on participating in sports like Kabbadi and Kho Kho. Though there is no category barrier for group events, generally it is senior school children who play such tough games. So I went on to ask them if they were okay to play against the big boys. A child promptly replied that as long as they knew the rules and had confidence they shan’t fear the opponent. It was an awakening for me that there is nothing that defeats confidence. Bhumi has taught me to push my limits and raise my bars. During a casual talk with a child while teaching Robotics in one of the Bhumi learning centres, I asked him what he wishes to become when he grows up. He replied, “I want to build robots like what you are teaching us”. There is nothing more fruitful for a teacher than hearing from students that the lessons taught have inspired them for the future. I started my tenure with Bhumi as project coordinator of Robotics in Bengaluru in the year 2016. It was a new project in the city, and not everyone was sure of how it would flourish being an offbeat project. Nevertheless, we just started the journey together, and now there are about 5 learning centres and 2 workshop modules, running swift and smooth. Thanks to all the volunteers who stood by and made this dream achievable. From the year 2018, I have been volunteering as the city coordinator of Bengaluru chapter. This one year I have been juggling all city activities like Catalyse, refresh and ignite. From managing volunteers to dealing with sponsors and donors, this has been a fun-filled roller coaster ride for me.